Well, it appears that I train for this Camino walk in the most unusual ways . . . I thought I’d begin again on the Kathy Fromme Trail near my house, but of course it’s been snowing on and off for the last two weeks. Twenty-two inches of snow doesn’t make for a great prairie path walk. Then last week, Neil and I left for ten days in South Carolina, and since I know Charleston is a great place to walk around, I brought my pedometer and envisioned walking the streets of this most charming southern city. Little did I know that I would find a very unusual way to walk nearly a full, albeit relatively short, trek . . . eleven miles on Friday. The first three miles were just as I had imagined . . . from our Inn to the aquarium, the lunch restaurant, the Visitor’s Center, and back to the Inn. 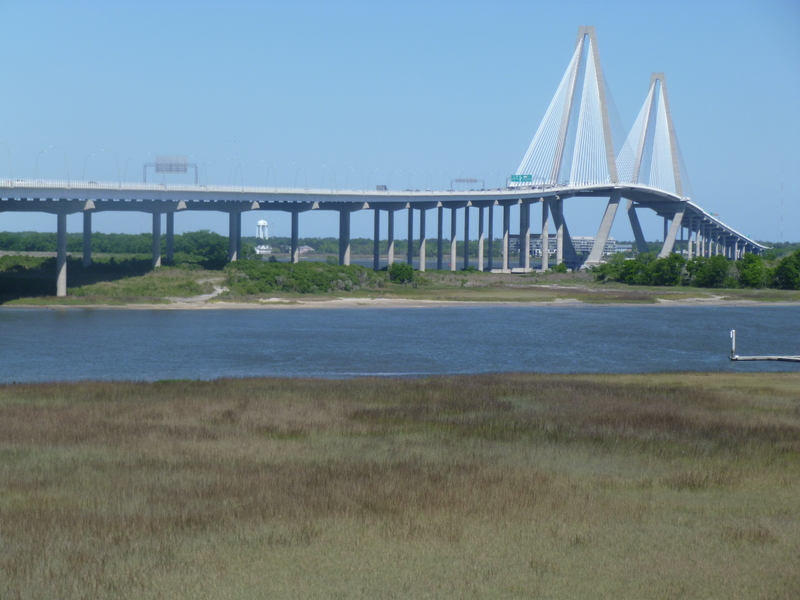 Ravenel Bridge – Charleston to Mount Pleasant, S.C.
A beautiful bridge, with white structure to make two diamonds hovering over the water. And you can walk it . . . from the divided highway entry on either side, across from one town to the other and back again. By the time we finished the whole walk, back and forth, and continued to our Inn, we had walked eight miles, added to the three miles we had covered in the morning. It felt exhilarating! The temperature was in the mid-70’s, not a cloud in the sky, with a brisk breeze to keep me cool. Together with our previous two days of walking, I definitely met the goal for the first of weeks 1-7 of my sixteen week training. Now our walking will be on bicycle paths at Hilton Head, and on the beaches in front of our temporary residence. Then home, where perhaps the snow will be melted! This entry was posted in Body readiness, Pedometers, Preparation, Ravenel Bridge, South Carolina Walking and tagged Camino training, Ravenel Bridge, walking. Bookmark the permalink.